Full elbow coverage, comfortable, low-profile fit. The Standard Elbow Skin is designed to be an effective pain management tool for most elbow injuries. The material is thin, breathable, and strong while providing medical-grade compression to the injured tissue. Compression increases circulation which enhances recovery and eases pain from injuries like Tennis and Golfer's Elbow. Compression also helps boost endurance and heighten proprioception. Use the Standard Elbow Skin to keep your muscles working at their best during exercise. Use the Standard Elbow Skin to relieve the pain and recover faster from many injuries, especially Tennis and Golfer's Elbow. The sleeve provides medical-grade compression to increase circulation, reduce inflammation, and support the joint. The material is light and breathable so it stays cool, dry, and comfortable all day long. 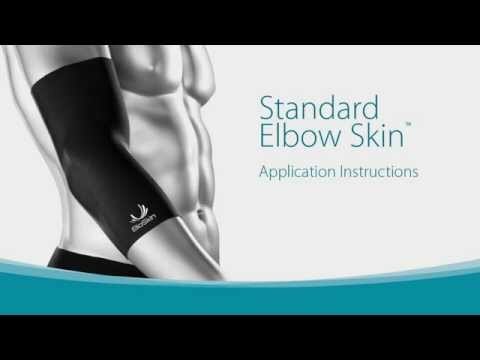 The Standard Elbow Skin can be used to reduce inflammation and prevent repetitive use injuries like Tennis and Golfer's Elbow. The medical-grade compression increases circulation and reduces inflammation so the damaged tissue can heal faster and more effectively. The Standard Elbow Skin also provides additional joint support and proprioceptive feedback to improve confidence and coordination during activity, further preventing injury. Stay active and enhance performance with the Standard Elbow Skin. The compression provided by the sleeve increases circulation. This increased blood flow means more oxygen and nutrients can be delivered to muscles in the area, allowing them to work harder, for longer. The sleeve also adds an extra layer of support to the joint so you can stay healthy during exercise. Use the Elbow Skin to enhance proprioception, the sensorimotor feedback to your brain which improves confidence and coordination of your movements. Put simply, the Standard Elbow Skin will help you perform your best.